This is the largest tree in the corner of Bishops Common near the Owen Graduate School of Management. Although ginkgo is not native to Tennessee, it is a unique and distinctive tree. It is unusual because it is a gymnosperm with broad deciduous leaves. (Most gymnosperms have evergreen needles). The fan shaped leaves are unmistakable with their repeatedly dividing veins, which gives the tree its common name "maidenhair tree". The leaves are often notched at the tip. From a distance, the leaves can make the branches look like large pipe cleaners. The bark of large trees is also distinctive with deep furrows and ridges. Ginkgo is dioecious and this particular tree is a female. In the summer you can find the ground below the tree littered with the "fruits" of the tree which are technically cones. The mature female cones stink like vomit and for that reason, most people prefer to plant only male trees. Most female trees are cut down after people get fed up with the stink. 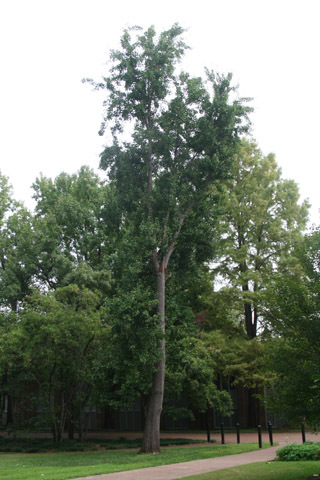 Until about 2007, there were several female ginkgo trees on Peabody campus until so many people complained about them that they were removed. This particular tree is one of only two female ginkgos left in the arboretum. The other is on the corner of Vanderbilt Place and West Side Row. Ginkgos were thought to be extinct until they were discovered growing in China in the last century. They are now widely planted in cities and towns. So this tree is a survivor in more ways than one! This organism is a living specimen that is part of the  Vanderbilt University Arboretum  with the local identifier 2-1014. Remarks: This individual is one of the few females on campus.